Odds are, you don't use just one device throughout the day—maybe it's a tablet at home over breakfast, a phone on the train to work, and then a computer or laptop once you're in the office. In other words, you expect to be able to get stuff done no matter where you are, which device you’re using, or what you’re working on. 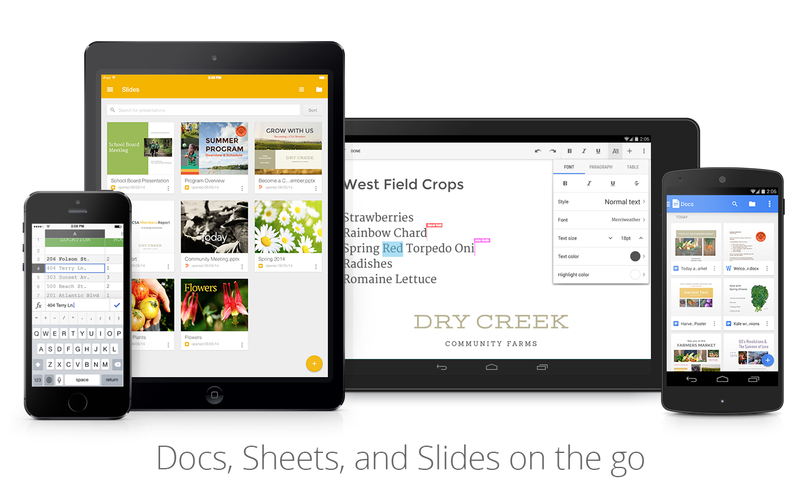 That’s why today, Docs, Sheets, and Slides are getting major updates on both mobile and desktop. With this release, you can now work on any document, at any time, on any device, both with and without an Internet connection. We recently launched mobile apps for Docs and Sheets that allow you to create and edit files on the go, even if you’re offline. We’re rounding out the trio with a new Slides mobile app that’s available starting today on Android and in the coming weeks on iOS. Sometimes people send you files and you need to be able to open them, make some edits, and send them back. If they don’t use Docs, Sheets and Slides it can be a challenge. Starting today, you no longer have to worry, because both the web and mobile apps for Docs, Sheets, and Slides let you edit Office files—without conversion—so you can now edit and send back files in their original format. 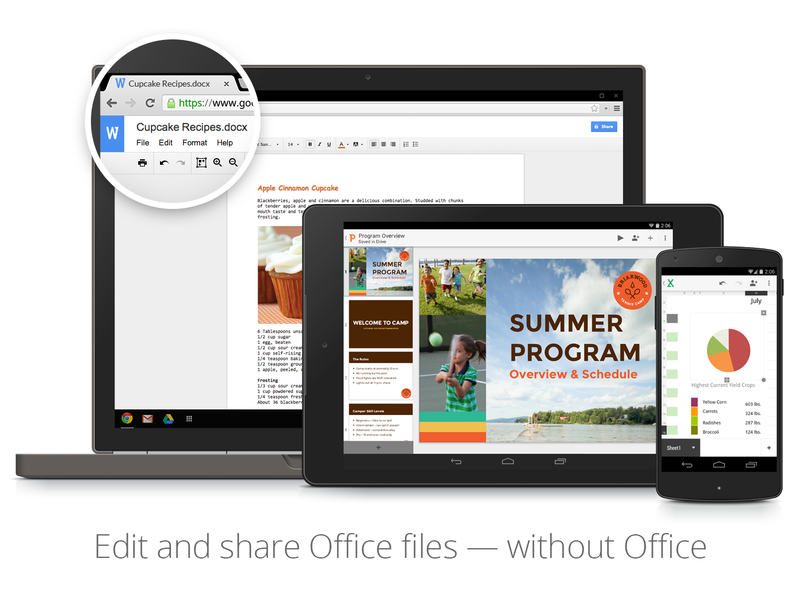 The updated mobile apps for Docs, Sheets and Slides come with Office editing built right in, and our new Chrome extension allows you to edit and share files directly from Google Drive, Gmail or from your Chromebook, where the extension is pre-installed. These updates will be available starting today, but may take a couple of days to fully roll out. Of course, if you want to collaborate seamlessly with others at the same time, simply convert the files to Docs, Sheets or Slides. People love using Docs because it’s so easy to work together in one place, rather than making edits and giving feedback by emailing multiple versions of the same document. But sometimes instead of giving your collaborators free reign to edit away, you’d rather they make suggestions that you can accept or reject later. That’s why today we’re excited to add Suggested Edits in Docs. This new feature is now available for anyone with commenting access in Google Docs on the web, and is coming soon to our mobile apps. With today’s updates to Docs, Sheets, and Slides, we’ve got you covered, regardless of how, where, or when you need to get something done. You now have mobile apps for Docs, Sheets and Slides, the ability to edit and share Office files, and a brand new way to collaborate with Suggested edits. It’s a big update, but more importantly, we hope it’s a big improvement for you.